It also had more flexibility to add new features and information. 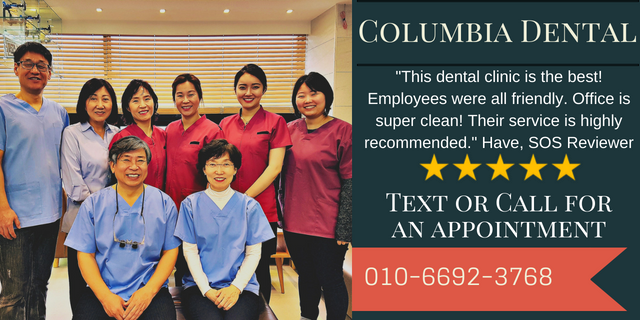 We hope you like is as much as we do. 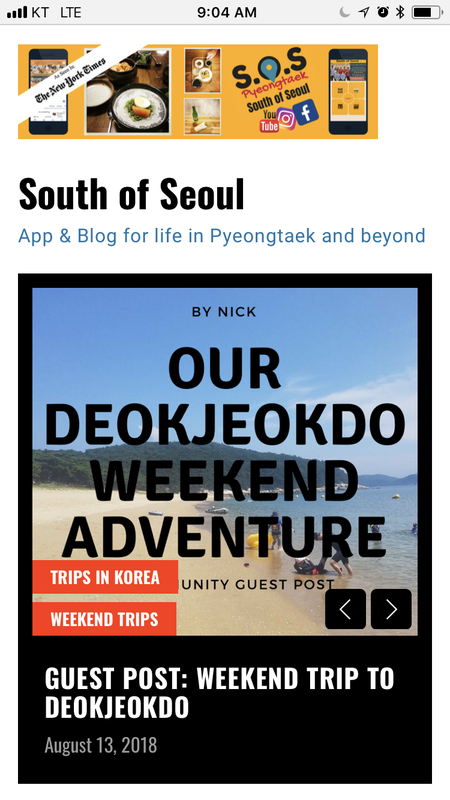 Visit https://blog.southofseoul.net/ and start following the new South of Seoul blog. 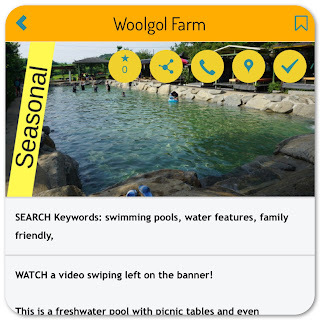 access to online menus in one central location. 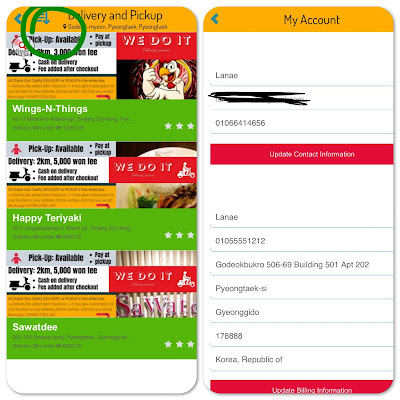 an English language app for ordering delivery or pickup from restaurants. As always, we run on no budget and we don't like to get between businesses and their money so we were creative in how we put this together. It absolutely wont be as flawless as something built by Google or funded startup. Instead, it's going to be a simple solution that addresses the unique needs of our community built as simply as possible. That means we all still might need to learn a few tricks to make it work as smoothly as possible. Go slow, click all the buttons, discover how it works and let us know if anything is so confusing you can't figure it out. This is the Beta Test to make sure it's feasible and helpful so feedback is important. PAYMENT: Although you will order through South of Seoul, you will not pay through the app. Just like with the Ride-share Reservations, money will be COD or handled through each individual restaurant. If everything goes well for users, for us, and for businesses we may try to add payment integration later, but for now, it's outside our comfort zone. 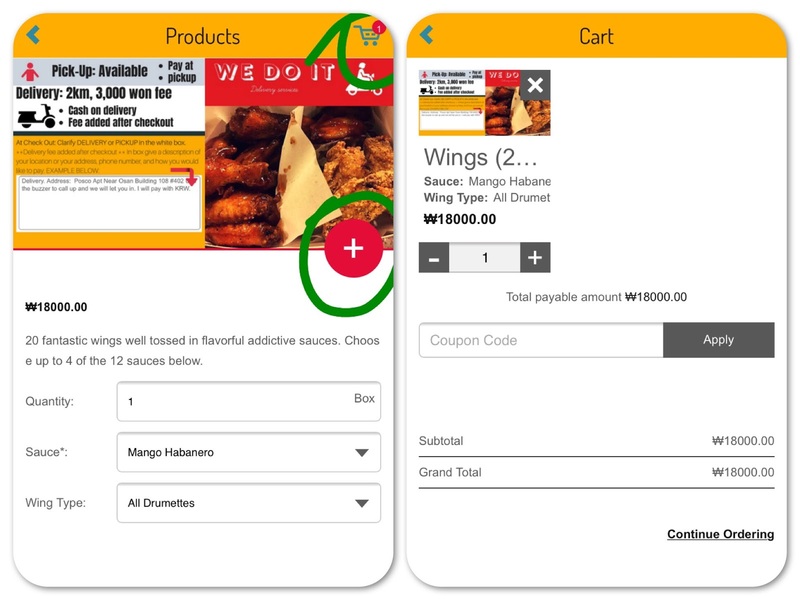 DELIVERY FEES: Each business will have their own delivery fees which will be added after checkout. We have placed these in the banners so that you can clearly see what they will be. Some businesses may charge more if you are further than 2km from their shop. The app will make it easy for you to get delivery because you pre-load your address and phone number into your profile. 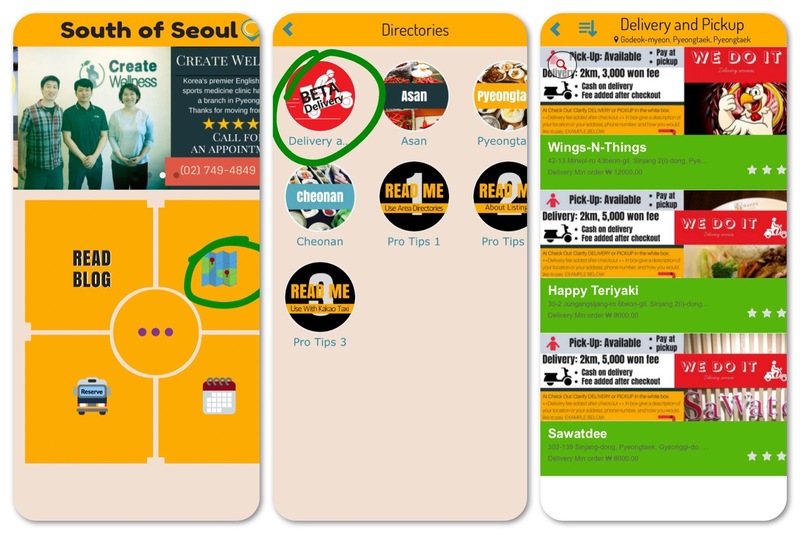 When you enter the Delivery area click on the three lines with a down arrow. This is going to allow you to access your orders and your account information. 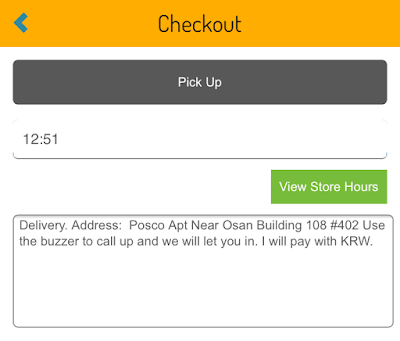 You can get your address all pre-loaded here so that it automatically sends when you place your order. Pretty awesome! Make sure this is accurately filled out to make this as easy as possible. Ask your realtor to enter your physical address if you don't know it. In addition to having your address loaded in your profile, there is also a white field in check-out where you can add more specific information about your location. To add to your cart you hit the plus sign. To check-out, you tap the cart in the top right. Once you have put in your order to might get a call to clarify payment options if they have any questions, so once again, make sure your profile information is all updated and accurate. FINGER COSSED THIS ALL GOES WELL!!! Easy pickup and delivery ordering is soooo needed. 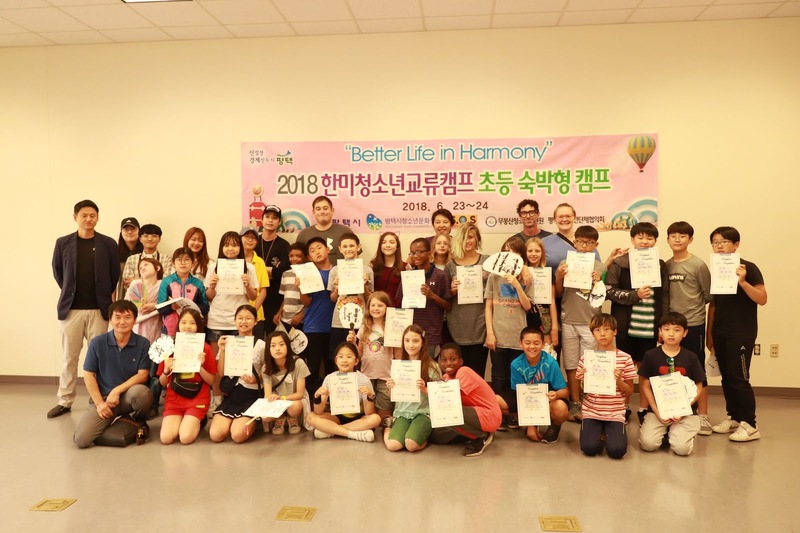 June 2018 Summer Camp is a blast for the Kids! 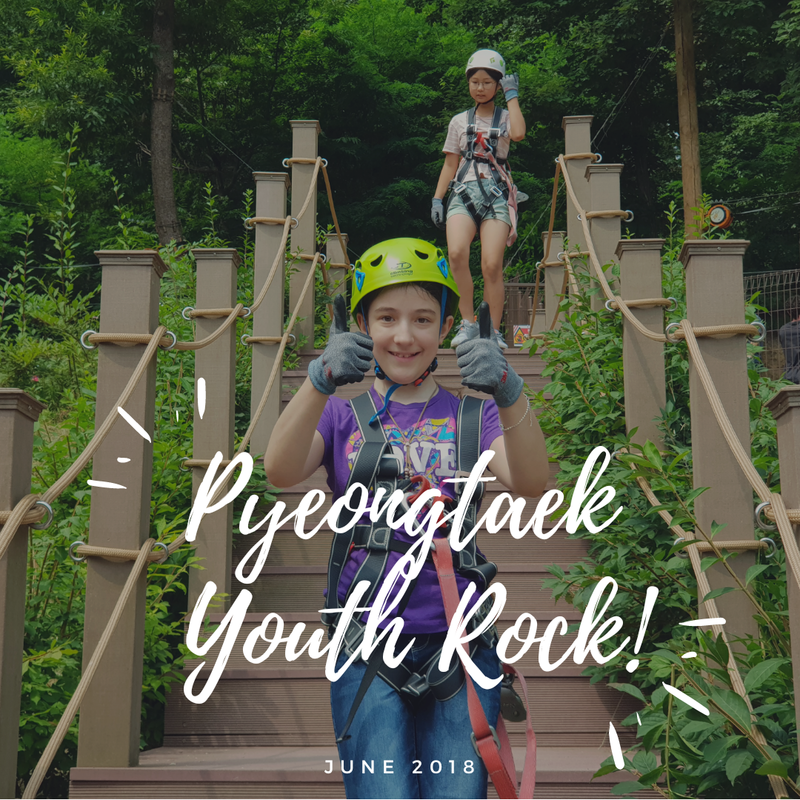 In case you haven't heard, Pyeongtaek Youth Rock! Earlier this year I had heard about a couple different camps being offered. As a mother of four, who is deeply invested in their children’s well-being, I was worried about what kind of experience was offered. I also worried if my kids would be safe. 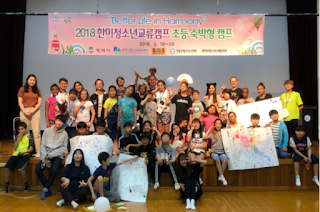 I talked to the parents of the kids who attended last year’s camps and found that the Pyeongtaek Youth Center group received consistently high praise. 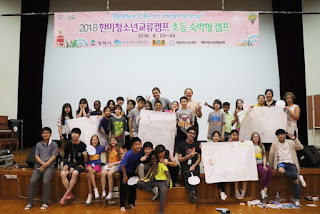 One parent said it was one of the most memorable moments of their time in Korea. In my heart, I believe kids need good opportunities and challenges to develop and grow, and this camp sounded like the right kind of opportunity. I signed them up and crossed my fingers that I was doing the right thing. After all, it does no good to live life as a worry rat. But for good measure, I volunteered to attend as a camp counselor. You know, so I could see for myself what really goes on at camp. The day came to pack our bags and get on the bus. My twin daughters were excited to attend their first camp. I was anxious because I wanted to do my part to help make camp an enjoyable experience for everyone. I would soon learn I had nothing to worry about. Our first event was the rope course. I don’t know what I was thinking when I agreed to join the difficult level course. I kind of consider myself out of shape. I seriously started to rethink my choices and wonder if the kid I saw who stayed on the ground was the smart one. But then I was hooked in and it was time to start. It was too late to run away. I may or may not have screamed a time or two, but I did the course and found myself enjoying it! Our adventure continued with no thought of slowing down! Take a look at this video to see some of the fun stuff we were up to! I have no clue how some of the kids still had the energy to stay up until midnight giggling and playing games. I consider myself a night owl and I was ready to hit the sack. When it was time to say goodbye I thought it was pretty cool that the kids could take home pictures of their camp experience! I admit that I am a little sad that our fun has come to an end! It was a memorable experience but more importantly, I discovered the truth about the Pyeongtaek Youth Center. As a parent, I can say confidently that your kids are in good hands. I was able to see first hand the counselors treating the kids fairly and with kindness. As a volunteer, I was able to see the leaders and counselors in action working hard to make this a good experience for the kids. Their efforts showed they truly care about the community. 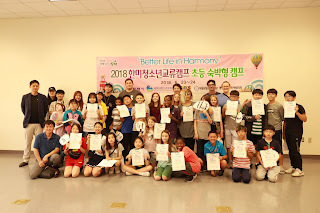 The theme of this camp is "Better Life in Harmony" and I think that sums it up nicely. Because of this, I look forward to helping out at the next camp! If you have kids that are interested in this kind of experience, then you don't want your kids missing out on the next one! Mark your calendars! The next one is in August and you can sign up HERE! 2018 Beach Bus Season Has Arrived! 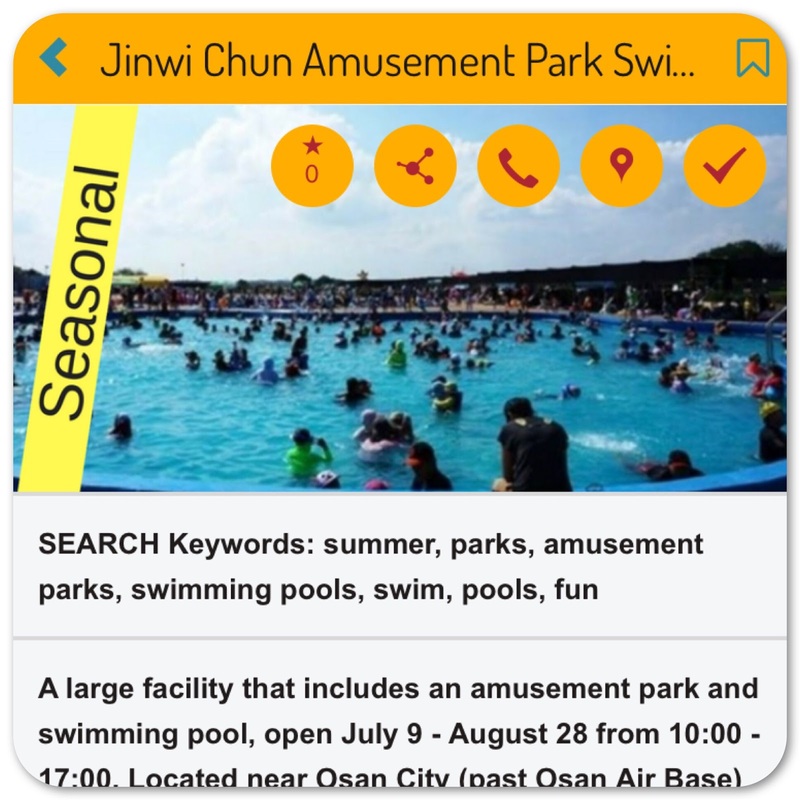 For the second year in a row, South of Seoul has ride-share buses leaving Pyeongtaek on select Saturdays, headed to beaches. Bus travel is wonderful because you can avoid the stress of traffic, driving home exhausted, not being able to have a drinky drink while at the beach. Heck, we even have cars but we still go on these buses because it makes the experience so much more relaxing. Not only are they the easiest way to get there, but the buses are surprisingly affordable. 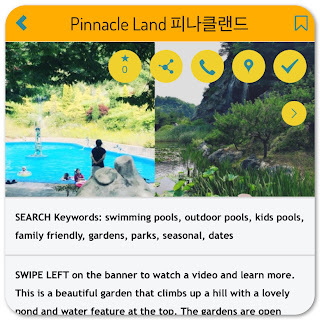 One-day trips are all under 20,000 won per person. Considering it usually takes 6-8 hours (BUT ONLY 2.5-3 WITH US!) on public transportation, it seems like a steal. 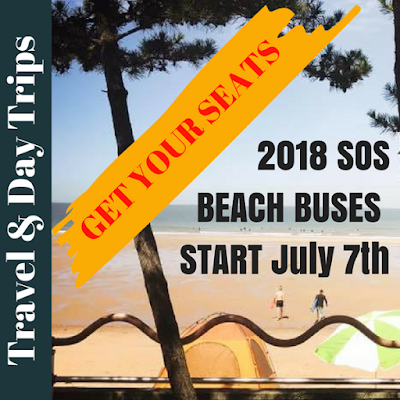 In fact, outside of having your own car, the SOS ride-share buses are the only real option for getting to the beaches nearest Pyeongtaek. These beaches are not for those who are looking for an experience just like the Bahamas. It's not going to be perfectly manicured to specific western ideals or super warm water. These beaches are about being outside and enjoying the sea air, splashing around, and being free of the city for the day. Korea has its own unique flavor and we love it. We swim, surf tiny waves, play in the sand, collect shells, dig for things, look at tiny crabs, and blissfully waste our day. On a rainy day, we read next to the sea, get wet, go to the botanical gardens, and still have a brilliant time. However, we understand it's not for folks who are shy about being in a new country. Especially the SOS ride-share trips because no one will be holding anyone's hand. Instead, we just all go together and enjoy our own free time. Maybe make some new friends or chill with the friends you came with. You don't pay in the app. Instead, we offer two ways to pay for the convenience of our local and US Military participants. Payment needs to be completed within 24 hours of submitting your seat request. Once payment has been verified you will get an email confirming your reservation. OPTION 1: PayPal southofseoul@gmail.com - please select the gift option or there are high fees taken out and that leaves the shared cost short. 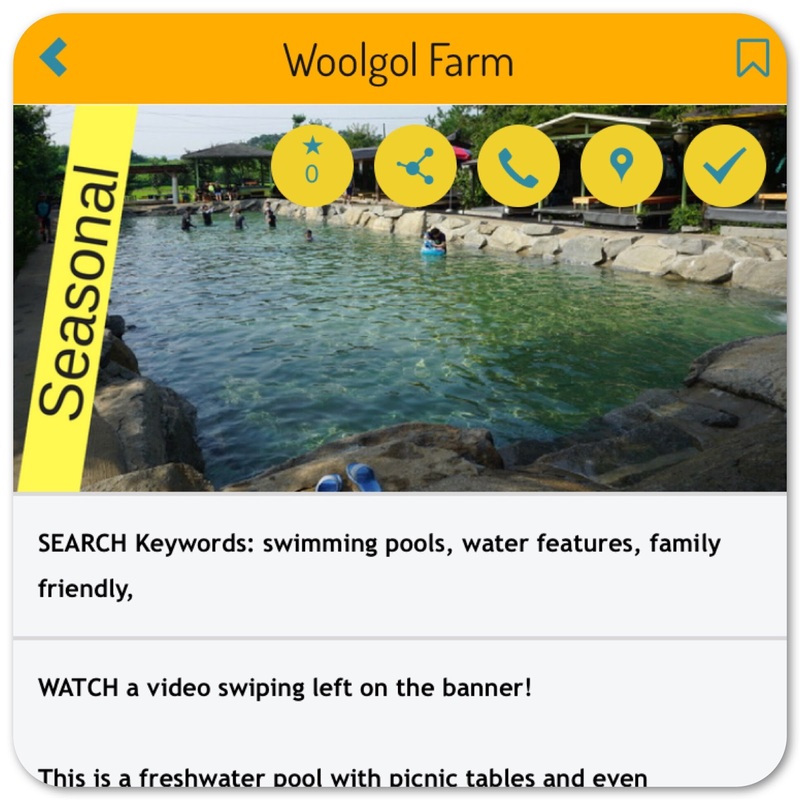 Pyeongtaek is close to a number of delightful beaches, yet they are surprisingly hard to get to because there are no direct express buses. We are changing that. We are doing this by harnessing the power of the community and renting buses for us all to share together. By pooling our resources we can all enjoy some time in the countryside even if we don't have cars or don't feel like driving. Nope, it’s not a tour. It’s a bus to the beach. There won’t be interpreters, no hand holding, no special stops, or pre-made meals. The bus driver picks us up, drops us off, and we explore the area. You are going to love it. Bring all the things you need to just sit back and relax. They will not drive us to lots of different places along the way. 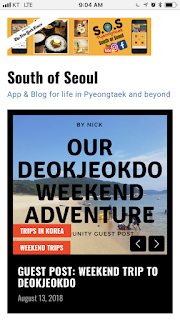 We go from Pyeongtaek to the beach and back. Anyone can go on the bus if they pay for a ticket. 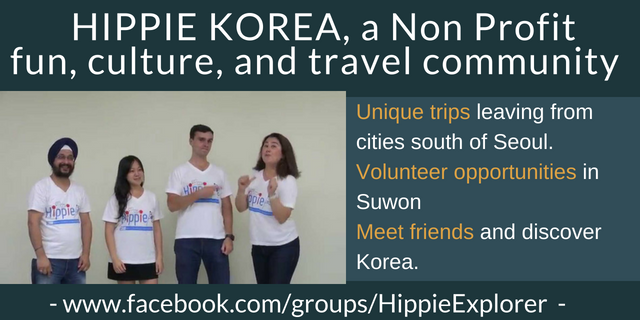 It’s for families, single travelers, teachers, military, friends, etc. You can be from Songtan, Anjung, Paengseong, Suwon, Dongtan, Yongin, etc. It’s also not just for foreigners. Bring all your friends no matter where they are from. It’s about having a beautiful time together in the summer. If you have a group that wants to go together (language meetup, church group, kids whatever, etc) just be sure to buy your tickets early so everyone can go. You will need to be there on-time. We can't hold the bus on the street for long periods of time. ARE THERE DISCOUNTED TICKETS FOR (fill in the blank)? No, there are not. The bus costs a base amount. We've based the tickets on that price. We are not a tour company nor good at math... simple division is all we can handle. Also, we are not affiliated with the military. This bus is for EVERYONE! So prices, are prices, are prices. The beaches on the west coast of Korea tend to be shallow with very small surf (often no surf). This makes them really fun for kids because they can play like crazy in the water. When it rains or there is a storm at sea it will affect the clarity of the water. No way around that. It’s how the ocean works. Over the last few years, we have seen clear blue waters as well as silty/muddy waters. Just depends on the weather around the time you visit. The beaches are sometimes a mix of rocky and sandy. There tend to be lovely tide pools and lots of little crabs to chase around. This is not Hawaii. It’s not South Florida. It’s not Mexico. It’s not a comparison game. We are sure that at some point in your life you went to a different beach than this and it was so much better. We aren’t going to the beach because it’s the best beach to ever exist in the world. We are going because beaches are awesome and these are the ones we have. 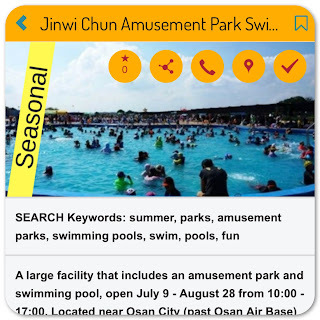 WHAT SERVICES ARE THERE AS THE BEACH? 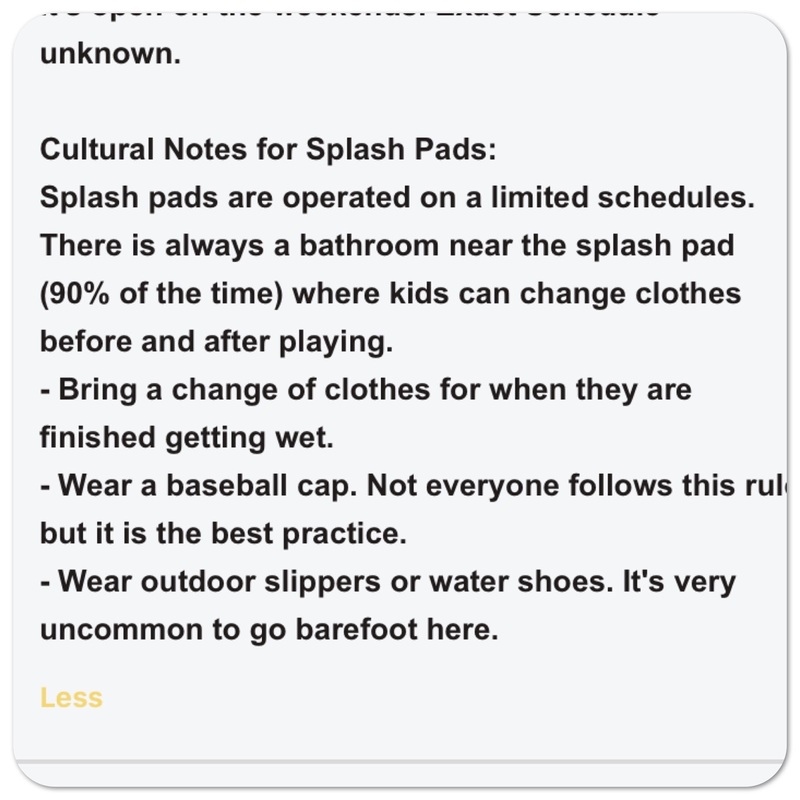 There are always restrooms, places to rent floaties, a snack shop, maybe a restaurant, and often showers. 95% of the food is Korean since this area is not heavily visited by tourists due to the lack of public transportation. If you don’t like Korean food, be sure to pack a picnic for the day. However, there will always be a convenience store for drinks, chips, water, etc. If we get there and you did not bring food and also don't like Korean food, this was your own personal choice to go hungry. 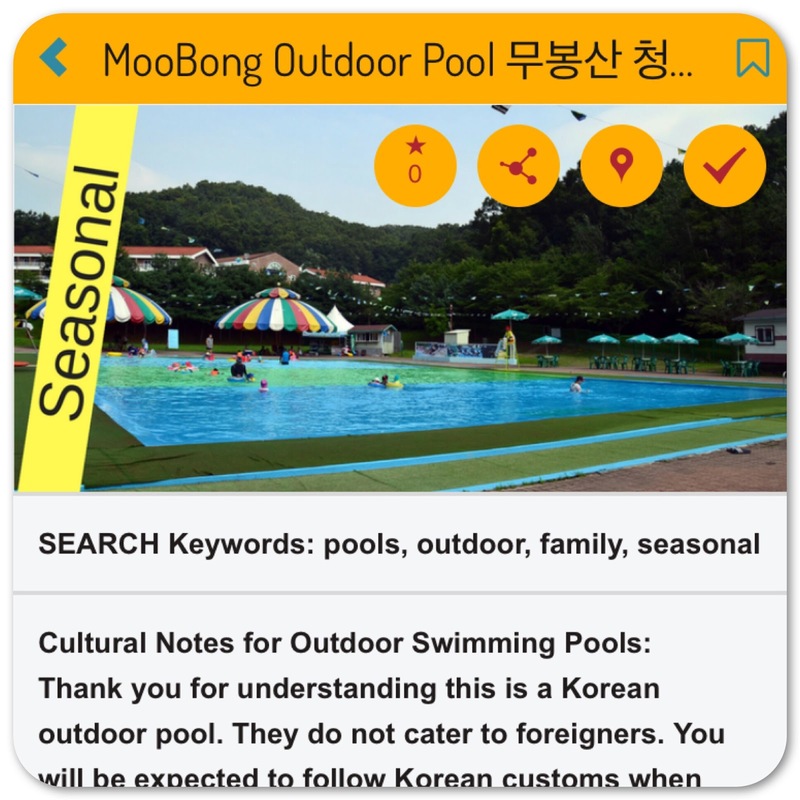 Korea has done nothing wrong by having its own food at beaches visited by Koreans. If there is a massive storm coming in we may re-route to a potentially less crazy area. However, we are talking a HUGE storm. If it's just raining we still go. The beach is awesome always and so far we have had great luck with the beach weather being excellent even when it's storming in Pyeongtaek. We don't refunds because we are all in this together. We rely on everyone paying their part. However, you can certainly find another person to fill your seat. That's up to you though. We can't help with this aspect. We don't have staff so we can't do the hustle. Of course, if we have to cancel we will give everyone their money back. CAN YOU HELP ME WITH (fill in the blank question on the trip)? No, not really. We are not going as tour guides, translators, or as information support. So, although we will be helping make sure all the passengers are loaded who are going to and from the beach, that’s the extent of it. We are an all-volunteer organization and don't have endless time to dedicate to this so please read everything before you ask questions. All that said, we are so excited for beach season!!!!! Let's do this!!!! 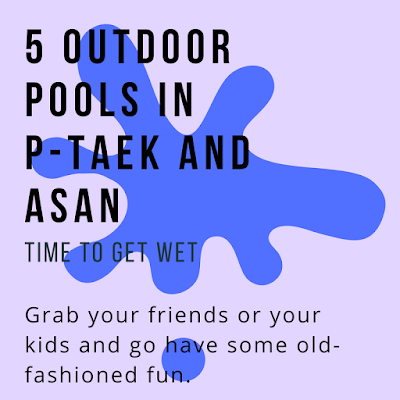 We have already told out about the splash pads that will be opening in August (read that here) but did you know there will be outdoor pools opening up soon as well? These are fab and fun places to connect with the local community while cooling off from the oppressive heat. 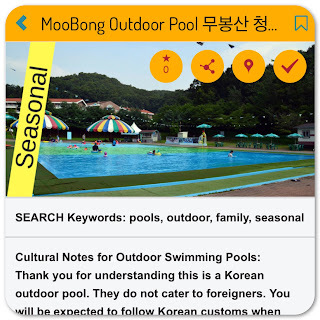 Remember, these are very Korean outdoor spaces so following local customs is very important and doable. No reason to be scared, but be prepared. 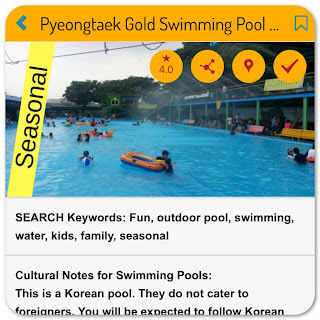 In order to have the most fun possible, be sure to read the South of Seoul Culture Notes that are embedded in each listing. These are useful tips we have compiled based on the surprises we have experienced. If you have a tip to add to the list just let us know! The more prepared everyone is when they arrive, the more fun we can all experience when integrating into the local culture. 1. When you try something new you are going to feel uncomfortable and this will be no exception. However, don't worry about it. Once you get the hang of it that feeling will go away. It's true that people might stare. Foreigners haven't known about these places until now. Not because we aren't welcome, but because information hasn't been available in English. This means all the locals are sitting there wondering, "How did they find this pool out in the countryside?" Don't worry, nobody hates you. Just go about your business of having fun in the sun. 2. It's going to be packed so politely squeeze in. For the best results show up early and stake your space with the cool picnic tents and mats from Daiso or Emart. There aren't that many pools, but there are a lot of people and they like their outdoor supplies. If you are freaked out by this then maybe outdoor pools aren't the right experience for you. That is ok. Know your limits. On the other hand, if you can deal with the experience it can be emotionally uplifting and help you feel more welcome and integrated into the community. We personally love it. We bring all our food, a tent for naps, and splash around like fools. 3. These pools aren't like the ones at home. They are usually waist deep, there aren't diving board or any other type of fanciness. These are old-fashioned, sometimes also just old, outdoor play areas for families to escape the heat. You aren't going to be swimming laps or diving for pennies. They are built for splashing and being silly together. Truly excellent places for kids. Think giant puddles and embrace it. 4. Go check out opening times as a test run. 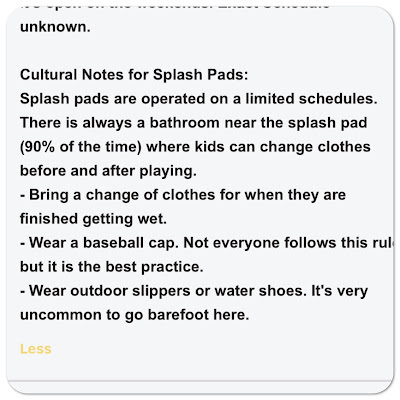 Before you pack up the kids for a pool day do a test run. Go find out for sure the days and times it's open (these can change from year to year). There is also a chance you could get lost going to these pools for the first time, so do a trial run before there are 3 kids in the car screaming they want to be in the pool. We ALWAYS recommend doing a trial run for any adventure. 5. Bring your own snacks and mat/tent to eat them on/in. In Korea food is almost always available but maybe it doesn't match with your dietary requirements or preferences. In order to avoid being hot and hangry, bring snacks. Also bring a mat/tent to lay claim to your dining and napping area. As always, the exact details of each listing is in the South of Seoul app which can be downloaded from Google Play and the Apple App Store.